Baby Jae is a contented baby who sleeps well in a cot and almost anywhere. This is a vast difference from Vee who had a serious case of I-hate-the-cot syndrome. Use a safe cot mattress that is firm, fits the cot well (with no gaps), and has molded pin holes for better air circulation. 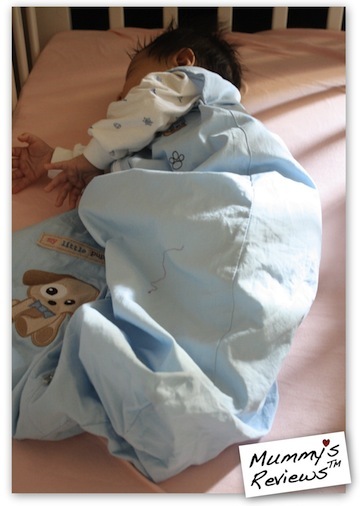 Use a fitted bedsheet designed for cot use. Check that it’s fitted well and tucked in properly every day. No soft and plush items such as pillow (including the popular bean pillow), bolster, soft toys, etc. My home-visit nurse suggested introducing these items after baby’s first birthday. If baby needs to be swaddled, use a swaddle that baby can’t undo. No conventional cot bumper — no matter how many times Jae gets his hands and legs stuck between the rails. Much safer than risking suffocation when he sleeps. An older baby can also use the bumper as steps to climb out of the cot. Instead, use a safer, breathable cot bumper, such as that by Airwrap. Place him on his back to sleep. At 3 months 1 week old, he started rolling over to sleep on his tummy. Initially, I flipped him back regularly. Then our nurse said his neck muscle control and rolling skills are very good, so we could just let him be. Phew! To keep him warm, use a sleep bag instead of blanket. 1. He can’t accidentally slip downwards or wriggle into a well-fitting sleep bag. 2. He can’t kick it off or roll away from it. Lower the cot mattress when he starts pulling up to stand. Disclosure: Mummy’s Reviews™ is a review site that receives compensation if readers make purchases from affiliate links (these are marked with an *). If we receive compensation from the companies whose products we review, this would be disclosed. These compensation help to maintain and grow Mummy’s Reviews™. We test each product thoroughly and give ratings according to our experience with it. We are independently owned and the opinions expressed here are our own.